Frost is a simple and easy weather service with the latest forecast for your current and favorite locations, with weather data for more than 8 000 000 locations around the globe. 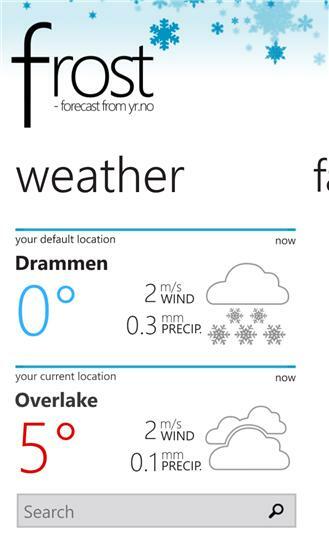 Mainfeatures: • Live tile that updates with closest location automatically • Many live tiles for your favorite location (paid) • Live lockscreen with weather images (paid) • Clean and simple graphical user interface • Optional flipping tiles with more information Features: • Your default location • Your current location (GPS) • Favorites • History • Statistics (Norwegian only) • Long Term Forecast • Hourly Forecast • Meteogram • Textforecast (Norwegian locations) • Sunrise • Sunset • Wind arrows (Speed, direction) • Celsius / Fahrenheit Frost uses data from the National Meteorological Institute of Norway, Yr.no. 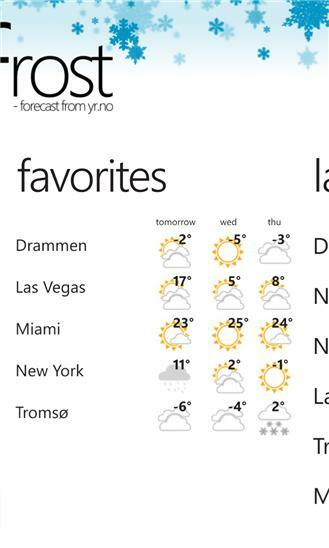 For more info, news and feedbacks, check out twitter.com/frostWeather Changes in version 2.2 • Added many new weather icons and turned of some debugging information that somehow slipped through in the previous builds.